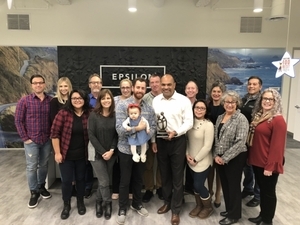 COSTA MESA, Calif., Jan. 18 /CSRwire/ - MOMS Orange County presents its Champion for Babies & Families award to Epsilon, a global leader in creating connections between people and brands, and an Alliance Data company. MOMS Orange County, a nonprofit organization dedicated to serving low-income pregnant women and young families for more than 26 years, launched the Champion for Babies & Families award in 2018 to honor and celebrate Orange County employers that create working environments which are exceptionally supportive of expectant employees and new families. “We are honored to present Epsilon with our Champion for Babies & Families Award and commend their outstanding support of their employees who are new parents,” said MOMS Orange County CEO Pamela Pimentel, RN. Epsilon, an all-encompassing global marketing company, takes great measures to support new families and employees who are expecting. The company offers 12 weeks of leave for new parents whether they have a child, adopt or have a foster child placed with them. The company increased their medical insurance coverage to include fertility treatments in 2019, and they provide financial support to families wishing to adopt. Epsilon provides nursing rooms, free breast pumps and a variety of child care options and support through Life Solutions. “Adding a new member to the family is an exciting and potentially stressful time. Because our associates are vital to the success of our business, we support these major life changes to make the transition to parenthood a little easier,” shared Laurie Fry, Epsilon senior vice president of human resources..
PHFE WIC was also honored with the 2019 Champion for Babies & Families award. WIC is a nutrition education program for low-income pregnant, breastfeeding and postpartum women, infants and children under age five.